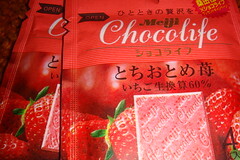 Who doesn't love a bit of Engrish on their chocolate? 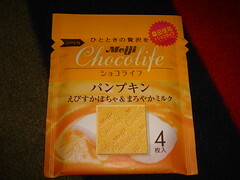 Meiji is probably my favorite chocolate company, and although I'm not sure what constitutes a Chocolife, I am tempted to live it. The two flavors I tried were pumpkin with milk and strawberry. The packaging and the chocolate itself are both sophisticated and lovely. Although I can't really say it tasted like pumpkin, it did taste delicious. My husband (who ate this with me) said it reminded him of cookie dough, and it had a pleasant grittiness that seems to be a recurring theme in the chocolates I've reviewed today. 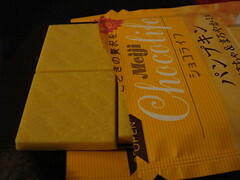 I also tried strawberry Chocolife, and I feel I must again mention grittiness - I'm really starting to appreciate that quality in a chocolate. Thankfully, it came from strawberry pulp and not seeds. This one is intensely fruity and definitively strawberry (unlike the ambiguously pumpkin chocolate above). Even though the pieces were very small and thin, I think the portion size was just right, as they were easy to savor. I can't pick a favorite between the two flavors, so I'll just have to wait until I try the matcha flavor; I'm sure matcha will be my favorite.